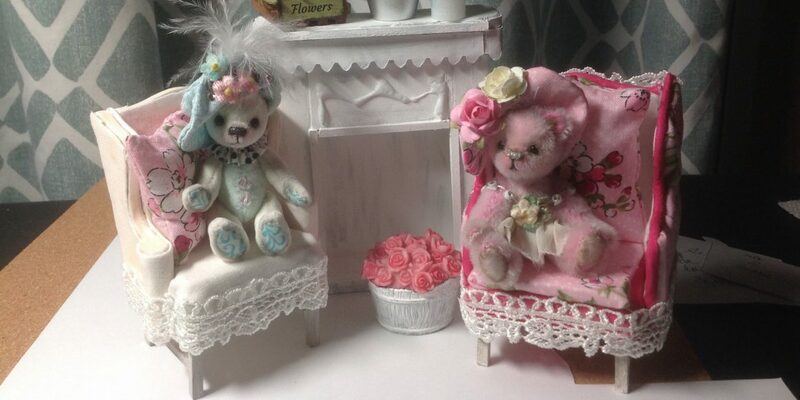 Here it is August 1st, and yesterday I started on my next Bear House, this one also a kit offered by Greenleaf Dollhouses called The Orchid. I Love, Love, LOVE my Rosebud Cottage, but I want to have more of a kitchen, a bathroom, you know, just more room! I have more creative juices that need an outlet. So many ideas in my head, and besides, I LOVE building and decorating to my heart’s content. This cottage is for my second set of bears, Sky and Squeaky, from Shaz Bears in Australia (I could only afford the belly of the plane to get them here, don’t judge me!) created by artist Sharon Hale. Rosebud and Charleen wanted some friends so they could have tea, and mess around (they are rather young bears, but maturing quickly). They will need a larger home in which to gather and play games and practice their cooking and homemaker skills. The Orchid offers room on two floors for 4 rooms, and a bump out on one side for a sunshine filled area for their large kitchen table. A great gathering place. I’m not crazy about the Victorian outside with all the trim, etc. But the “bones” are good. I drew new plans to enlarge the front windows, install a manufactured front door with a transom, changed the front gable window to an arched one like in Rosebud Cottage, and a 5 inch bump out on the side for the kitchen/dining area with a large window and a screen door out to a tiny fenced in garden with a fountain. I’ve done my calculations and hope to fire up the jigsaw tonite and start sawing away! Next time, painting window trim and doors…..the excitement builds!